I am borrowing a concept from the business world called velocity or rate of spending. It is a simple but powerful concept first coined by the economist Irving Fisher. Looking for part one of this series? Velocity in business was first explained to me in a story of a professor that would bring his business students to a shop in Chinatown where they would try to understand how the shop could be so successful with such tiny margins on relatively inexpensive items. Velocity was the answer: how many times the shop owner could completely turn over his stock in a single day. We don’t have an exact corollary to what we are going to try and measure in our Patreon growth efforts. But that’s not to say that velocity isn’t important. 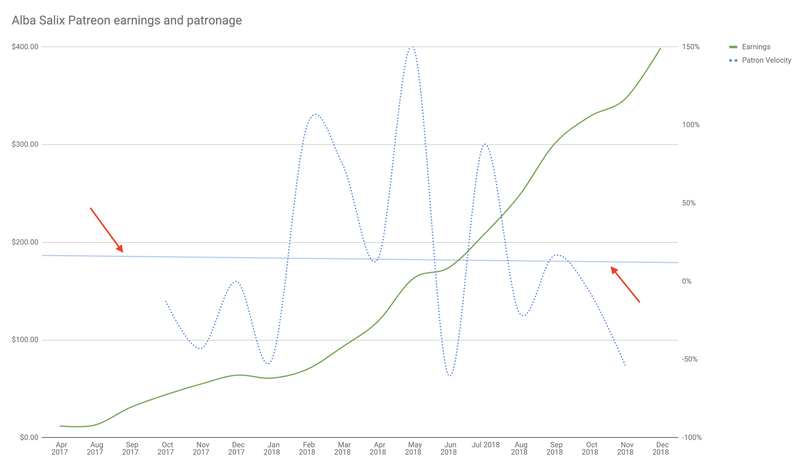 I measure patron velocity as the growth rate of patrons each month. Using the above equation in Google Sheets is pretty straight forward and it allows us to monitor patron growth more closely. You are welcome to make a copy of our patron velocity Google Sheet template. Let’s look at the chart below. Everything looks great, no? The green line represents our monthly earnings and it uses the left y-axis values. So it shows solid growth from $20 all the way to $400 in December. The orange dotted line shows that our average pledge amounts dipped significantly in October through January, but are now on the rise with our average pledge surpassing $3.00 in December of 2018. Maybe. Let’s check in on our patron velocity. And let’s look at where we were in November of 2018 just to accentuate a point. The green line shows our earnings, like before. But now it is overlaid with our patron velocity which is shown as a dotted blue line. The red arrows are identifying what we call a trend line; a solid blue line that is slowly angling downward. A trend line smooths out all the ups and downs and identifies the general course of the data. In this case it is levelling out the bouncing nature of the dotted blue line. And it clearly shows that we are trending downward. We are bringing in, on average, fewer new patrons every month. And this is not good. The velocity chart above is pretty much why we chose to participate in the beta special offer program in December. After which, I’m happy to report that our velocity is back on track. The solid blue trend line is happily heading upwards which together with our increased average pledge amount means we are heading towards sustainability and good growth for our Patreon. Watching our patron velocity allowed us to identify a problem early and participate in a program that drove our velocity back on track. Data can be deceptive. As you saw above, without velocity things looked quite rosy. 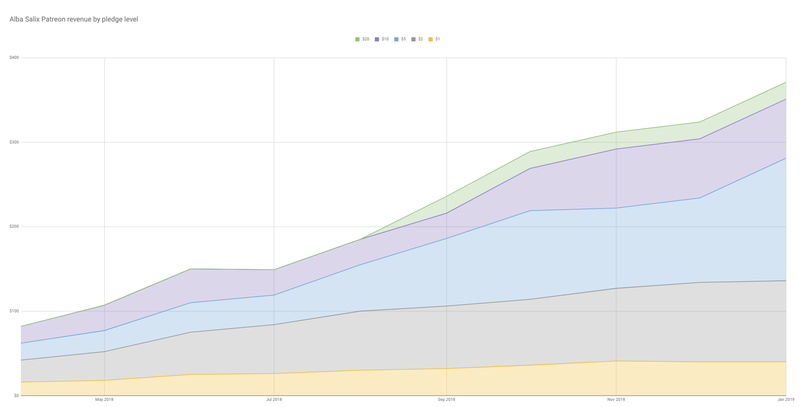 The number of new patrons can betrending downwards, but because our average pledge amount is rising, it looks like our total pledge revenue is growing quite strongly. The increase in amount pledged is temporarily offsetting the slow decline in the number of new patrons month over month. But if your patron velocity stays negative for too long, there will be a swing downward on your total pledged revenue. It may take a little while to catch up with you, but when it does, expect a harsh correction. It is far better to monitor velocity, in my mind, and be able to correct the situation immediately.